"Imam Hassan" redirects here. For places in Iran, see Imam Hassan, Iran. Al-Ḥasan ibn ʿAlī ibn Abī Ṭālib (Arabic: الحسن ابن علي ابن أبي طالب‎‎‎, 624–670 CE), commonly called "Hasan," was the second Shi‘ite Imam, succeeding his father ‘Ali, and preceding his younger brother Al-Husayn. He was the elder son of ‘Ali and Muhammad's daughter, Fatimah. Sunni Muslims respect him as a grandson of the Islamic Nabi (Arabic: نَـبِي‎‎, Prophet) Muhammad, and the 5th rightly guided Khalifah (Arabic: خـلـيـفـة‎‎, 'Caliph'), having succeeded his father in this regard, besides other things. He abdicated after six or seven months, and Mu‘awiyah succeeded him to become the first Umayyad Caliph. For the rest of his life, al-Hasan lived in al-Medinah, in seclusion, until he died at the age of 45 or 46, and was buried in the Jannat al Baqi‘ cemetery in al-Medinah. His wife, Ja'da bint al-Ash'at, is commonly accused of having poisoned him. Al-Hasan was known for donating to the poor, and being kind to them and bondmen, and his knowledge, tolerance and bravery. When Al-Hasan was born in the year 624 CE, Muhammad slaughtered a ram for the poor on the occasion of his birth, and chose the name "Al-Ḥasan" for him. Fatimah shaved his head and gave the weight of his hair in silver as alms. According to Shi'ite belief, theirs was the only house that archangel Gabriel allowed to have a door to the courtyard of al-Masjid an-Nabawi (الـمـسـجـد الـنّـبـوي, "the Mosque of the Prophet"). Both Shi‘ite and Sunni Muslims consider Al-Hasan to belong to the Bayt (Arabic: بـيـت‎‎, 'Household') of Muhammad, Ahl al-Kisa’ (أهـل الـكـسـاء, "People of the Cloak"), and participants of the Event of Mubahalah. There are many narrations showing the respect of Muhammad toward his grandsons, including the statements that his two grandsons would be sayyedā šabāb (masters of youth) of Paradise," and that they were Imams "whether they stand up or sit down. "[lower-alpha 1] He also reportedly predicted that Al-Hasan would make peace between two factions of Muslims. In the year 10 AH (631/32 CE) a Christian envoy from Najran (now in northern Yemen) came to Muhammad to argue which of the two parties erred in its doctrine concerning ‘Isa (Arabic: عـيـسى‎‎, Jesus). After likening Jesus' miraculous birth to Adam's creation,[lower-alpha 2]—who was born to neither a mother nor a father — and when the Christians did not accept the Islamic doctrine about Jesus, Muhammad was instructed to call them to Mubahalah where each party should ask God to destroy the false party and their families. "If anyone dispute with you in this matter (concerning Jesus) after the knowledge which has come to you, say: Come let us call our sons and your sons, our women and your women, ourselves and yourselves, then let us swear an oath and place the curse of God on those who lie. "[lower-alpha 3] Except for al-Tabari, who did not name the participants, Sunni historians mention Muhammad, Fatimah, Al-Hasan and Al-Husayn as having participated in the Mubahalah, and some agree with the Shi'ite tradition that ‘Ali was among them. Accordingly, in the Shi'ite perspective, in the verse of Mubahalah, the phrase "our sons" would refer to Al-Hasan and Al-Husayn, "our women" refers to Fatimah, and "ourselves" refers to ‘Ali. 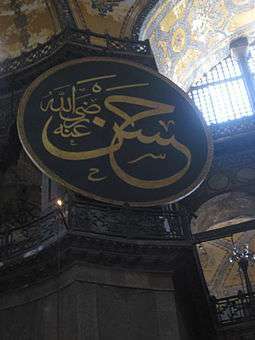 It is said that one day, the ‘Abbasid Caliph Harun al-Rashid questioned the seventh Twelver Shi‘ite Imam, Musa al-Kadhim, saying why he had permitted people to call him "Son of the Apostle of Allah," while he and his forefathers were Muhammad's daughter's children, and that "the progeny belongs to the male (‘Ali) and not to the female (Fatimah)." In response al-Kadhim recited the verses Quran, 6:84 and Quran, 6:85 and then asked "Who is Jesus' father, O Commander of the faithful?". "Jesus had no father," said Harun. Al-Kadhim argued that God, in these verses, had ascribed Jesus to descendants of Prophets, through Mary, saying "similarly, we have been ascribed to the descendants of the Prophet through our mother Fatimah." It is related that Harun asked Musa to give him more evidence and proof." Al-Kadhim thus recited the verse of Mubahalah, and argued "None claims that the Prophet made someone enter under the cloak when he challenged the Christians to a contest of prayer to God (the Mubahalah), except ‘Ali, Fatimah, Al-Hasan, and Al-Husayn. So in the verse, "Our sons" refers to Al-Hasan and Al-Husayn. 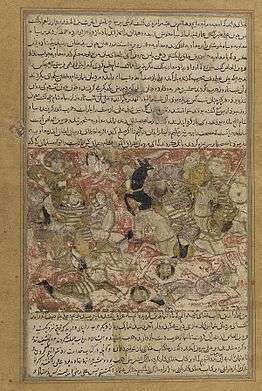 The Battle of Siffin, in which followers of Caliph ‘Ali, including Al-Hasan, fought the party of Mu‘awiyah. Al-Hasan was one of the guards defending ‘Uthman ibn ‘Affan when the attackers went round the latter and killed him. During the reign of ‘Ali, he was a participant in the Battles of Siffin and Nahrawan. According to Donaldson there was not a significant difference between the idea of Imamate, or divine right, expressed by each Imam designating his successor and other ideas of succession at first. ‘Ali had apparently failed to nominate a successor before he died, however, on several occasions, reportedly expressed his idea that "only the Prophet's Bayt were entitled to rule the Community," and Al-Hasan, whom he had appointed his inheritor, must have been the obvious choice, as he would eventually be chosen by people to be the next Caliph. Sunnis, on the other hand, reject Imamate on the basis of the Qur'an[lower-alpha 4] which says that Muhammad, as the Khatam an-Nabiyyin (Arabic: خـاتـم الـنّـبـيّـيـن‎‎, "Seal of the Prophets"), was not to be succeeded by any of his family; and that is why God let Muhammad's sons die in infancy. [lower-alpha 5] This is why Muhammad did not nominate a successor, as he wanted to leave the succession to be resolved "by the Muslim Community on the basis of the Qur’anic principle of consultation (Shura)." The question Madelung proposes here is why the family members of Muhammad should not inherit other (other than prophethood) aspects of Muhammad's character such as Hukm (Arabic: حُـكـم‎‎, Rule), Hikmah (Arabic: حِـكـمـة‎‎, Wisdom), and Imamah (Arabic: إمـامـة‎‎, Leadership). Since the Sunni concept of the "true caliphate" itself defines it as a "succession of the Prophet in every respect except his prophethood", Madelung further asks "If God really wanted to indicate that he should not be succeeded by any of his family, why did He not let his grandsons and other kin die like his sons?" After ‘Ali was assassinated, Al-Hasan became the Caliph of the Ummah, in a manner which followed the custom established by Abu Bakr. He made a speech at al-Masjid al-Mu‘azzam bil-Kufah (Arabic: الـمـسـجـد الـمـعـظّـم بِـالـكـوفـة‎‎, "the Great Mosque in Al-Kufah") in which he praised the merits of his family, quoting verses of the Qur’an on the matter: "I am of the family of the Prophet from whom Allah has removed filth and whom He has purified, whose love He has made obligatory in ًHis Book when He said: "Whosoever performs a good act, We shall increase the good in it. "[lower-alpha 6] Performing a good act is love for us, the family of the Prophet." Qays ibn Sa'd was the first to give allegiance to him. Qays then stipulated the condition that the Bay'ah (Arabic: بَـيْـعَـة‎‎, Pledge of Allegiance) should be based on: on the Qur’an, the Sunnah (Arabic: سُـنَّـة‎‎, Deeds, Sayings, etc.) of Muhammad, and on the condition of a Jihad (Arabic: جِـهَـاد‎‎, Struggle) against those who declared Halal (Arabic: حَـلَال‎‎, Lawful) that which was Haram (Arabic: حَـرَام‎‎, Unlawful). Al-Hasan, however, tried to avoid the last condition by saying that it was implicitly included in the first two, as if he knew, as Jafri put it, from the very beginning, the Iraqis' lack of resolution in time of trials, and thus Al-Hasan wanted to "avoid commitment to an extreme stand which might lead to complete disaster." As soon as the news of Al-Hasan's selection reached Mu‘awiyah, who had been fighting ‘Ali for the caliphate, he condemned the selection, and declared his decision not to recognize him. Letters exchanged between Al-Hasan and Mu‘awiyah before their troops faced each other were to no avail. However, these letters, which are recorded in Madelung and Jafri's books, provide useful arguments concerning the rights of Caliphate which will lead to the origin of the Shi‘ah (Arabic: شـيـعـة‎‎, Party) (of ‘Ali and the Household of Muhammad). In one of his long letters to Mu‘awiyah in which summoned him to pledge allegiance to him, Al-Hasan made use of the argument of his father, ‘Ali, which the latter had advanced against Abu Bakr after the death of Muhammad. ‘Ali had said: "If Quraysh could claim the leadership over the Ansar on the grounds that the Prophet belonged to Quraysh, then the members of his family, who were the nearest to him in every respect, were better qualified for the leadership of the community." Mu‘awiyah's response to this argument is also interesting. For Mu‘awiyah, while recognizing the excellence of the Muhammad’s family, further asserted that he would willingly follow Al-Hasan's request were it not for his own superior experience in governing:"…You are asking me to settle the matter peacefully and surrender, but the situation concerning you and me today is like the one between you [your family] and Abu Bakr after the death of the Prophet … I have a longer period of reign [probably referring to his governorship], and I am more experienced, better in policies, and older in age than you … If you enter into obedience to me now, you will accede to the caliphate after me." In his book, The Origins and Early Development of Shi‘a Islam, Jafri comes to the conclusion that the majority of the Muslims, who became known as Sunnis afterwards, "placed the religious leadership in the totality of the community (Ahl al-Sunnah wal Jamaah), represented by the Ulama, as the custodian of religion and the exponent of the Qur’an and the Sunnah of the Muhammad, while accepting state authority as binding… A minority of the Muslims, on the other hand, could not find satisfaction for their religious aspirations except in the charismatic leadership from among the people of the house of the Prophet, the Ahl al-Bayt, as the sole exponents of the Qur’an and the Prophetic Sunnah, although this minority too had to accept the state's authority. This group was called the Shi‘ah." There was more corresponding with no result, so as negotiations stalled, Mu‘awiyah summoned all the commanders of his forces in Ash-Sham (Arabic: اَلـشَّـام‎‎, the region of Syria, Palestine, and Transjordan), and began preparations for war. Soon later he marched his army of sixty thousand men through Mesopotamia to Maskin, on the Tigris boundary of Mosul, towards the Sawad. Meanwhile, he attempted to negotiate with Al-Hasan, sending the young heir letters asking him to give up his claim. According to Jafri, Muawiyah hoped to either force Hasan to come to terms; or attack the Iraqi forces before they had time to strengthen their location. However, Jafri says, Muawiyah knew if Hasan was defeated and killed, he was still a threat; for, another member of the clan of Hashim could simply claim to be his successor. Should he abdicate in favour of Mu‘awiyah, however, such claims would have no weight and Mu‘awiya's position would be guaranteed. According to Jafri this policy proved to be correct, for even ten years later, after the death of Al-Hasan, when ‘Iraqis turned to his younger brother, Al-Husayn, concerning an uprising, Al-Husayn instructed them to wait as long as Mu‘awiyah was alive due to Al-Hasan's peace treaty with him. As the news of Mu‘awiya's army reached Al-Hasan, he sent someone to his local governors ordering them to get ready to set out, then addressed the people of the Al-Kufah with a war speech: "God had prescribed the Jihad for his creation and called it a loathsome duty. "[lower-alpha 7] There was no response at first, as some tribal chiefs, paid by Mu‘awiyah, were reluctant to move. Hasan's companions scolded them, asking whether they won't answer to the son of the Prophet's daughter? Turning to Hasan they assured him of their obedience, and immediately left for the war camp. Al-Hasan admired them and later joined them at An-Nukhayla, where people were coming together in large groups. Al-Hasan appointed ‘Ubayd Allah ibn al-‘Abbas as the commander of his vanguard of twelve thousand men to move to Maskin. There he was told to keep back Mu‘awiyah until Al-Hasan arrived with the main army. He was advised not to fight, unless attacked, and that he should consult with Qays ibn Sa'd who was appointed as second in command if he were killed. While Al-Hasan's vanguard was waiting for his arrival at Maskin, Al-Hasan himself was facing a serious problem at Sabat near Al-Mada'in, where he gave a sermon after morning prayer in which he declared that he prayed to God to be the most sincere of His creation to His creation; that he bore no resentment nor hatred against any Muslim, nor did he want evil and harm to anyone; and that "whatever they hated in community was better than what they loved in schism." He was, he continued, looking after their best interest, better than they themselves; and instructed them not to disobey "whatever orders he gave them." Some of the troops, taking this as a sign that Al-Hasan was preparing to give up battle, rebelled against him, looted his tent, seizing even the prayer rug from underneath him. Al-Hasan shouted for his horse and rode off surrounded by his partisans who kept back those who were trying to reach him. While they were passing by Sabat, however, al-Jarrah ibn Sinan, a Kharijite, managed to ambush Hasan and wounded him in the thigh with a dagger, while he was shouting: "God is the Greatest! You have become a Kafir (Arabic: كـافـر‎‎, Infidel) like your father before you." ‘Abd Allah ibn al-Hisl jumped upon him, and as others joined in, al-Jarrah was overpowered, and he died. Al-Hasan was taken to Al-Mada'in where he was cared for by his governor, Sa'd ibn Mas'ud al-Thaqafi The news of this attack, having been spread by Mu‘awiyah, further demoralized the already discouraged army of Al-Hasan, and led to extensive desertion from his troops. When ‘Ubayd Allah with the Kufan vanguard arrived al-Maskin where Mu‘awiyah had already reached, the latter sent an envoy to tell them that he had received letters from Hasan asking for an armistice and that he asked the Kufans not to attack until he finished his negotiations with Hasan. Muawiyyah's claim was probably untrue; but he had good reason to think that he could make Hasan to give in. The Kufans, however, insulted Muawiyah's envoy and reviled him. Next Muawiya sent the envoy to visit Ubayd Allah in private, and to swore to him that Hasan had requested Muawiyah for a truce, and that Muawiyah was offering Ubayd Allah 1,000,000 dirhams, half of which to be paid at once, the other half in Kufa, provided he went over to him. Ubayd Allah accepted and abandoned at night to Muawiyah's camp. Muawiyah was extremely pleased and fulfilled his promise to him. The next morning, the Kufans waited for ‘Ubayd Allah to emerge and lead the morning prayer. Then Qays ibn Sa'd took charge and, in his sermon, severely denounced ‘Ubayd Allah, his father and his brother. The people shouted: "Praise be to God that He has removed him from us; stand up with us against our enemy." Believing that the abandonment of ‘Ubayd Allah had broken the spirit of his enemy, Mu‘awiyah sent Busr with a troop to make them give up. Qays attacked and drove him back. The next day Busr attacked with a larger troop but was kept back again. Muawiyah now sent a letter to Qays offering bribes but Qays replied that he "would never meet him except with a lance between them." As the news of the riot against Hasan and of his having been wounded arrived, however, both sides abstained from fighting to wait for further news. Mu‘awiyah, who had already started negotiations with Al-Hasan, now sent high-level envoys, while committing himself in a witnessed letter to appoint Hasan his successor and give him whatever he wished. Hasan accepted the offer in principle and sent ‘Amr ibn Salima al-Hamdani al-Arhabl and his own brother-in-law Muhammad ibn al-Ash'ath back to Mu'awiyah as his negotiators, together with the envoys of the latter. Mu'awiyah then wrote a letter saying that he was making peace with Hasan on the basis that Hasan would inherit the reign after him. He swore that he would not seek to harm him; and that he would give him 1,000,000 dirhams from the treasury (Bayt al-mal) annually, along with the land tax of Fasa and Darabjird; to which Hasan was to send his own tax agents to collect it. The letter was witnessed by the four envoys and dated in August 661. When Al-Hasan read the letter he commented: "He is trying to appeal to my greed for a matter which, if I desired it, I would not surrender to him." Then he sent ‘Abd Allah ibn al-Harith, whose mother, Hind, was Mu‘awiyah's sister, to Mu‘awiyah, instructing him: "Go to your uncle and tell him: If you grant safety to the people I shall pledge allegiance to you." After which, Mu'awiyah gave him a blank paper with his seal at the bottom, inviting Hasan to write on it whatever he desired. According to Jafri, historians like Ya'qubi and Al-Masudi do not mention the terms of peace treaty at all. Other historians such as Dinawari, Ibn Abd al-Barr and Ibn al-Athir records different accounts of the conditions. And the timing of the black sheet sent by Mu'awiyah to Hasan was confusing in Tabari's account. The most comprehensive account, which explains the different ambiguous accounts of other sources, according to Jafri, is given by Ahmad ibn A'tham, which must have taken it from al-Mada'ini. Madelung's view is close to that of Jafri when he stipulates that Hasan surrendered the reign over the Muslims to Mu'awiyah on the basis that "he act according to the Book of God, the Sunnah of His Prophet and the conduct of the righteous caliphs. Mu'awiyah should not be entitled to appoint his successor but that there should be an electoral council (Shura); the people would be safe, wherever they were, with respect to their person, their property and their offspring; Mu'awiyah would not seek any wrong against Hasan secretly or openly, and would not intimidate any of his companions." The letter was testified by Abd Allah ibn al-Harith, and Amr ibn Salima and transmitted by them to Mu'awiyah for him to take recognition of its contents and to confirm his acceptance. Hasan, thus, surrendered his control of Iraq in Rabi II 41/August 661 after a reign of seven months. After the peace treaty with Al-Hasan, Mu‘awiyah set out with his troops to Kufa, where at a public surrender ceremony Al-Hasan rose and reminded the people that he and Al-Husayn were the only grandsons of Muhammad. And that he had surrendered the reign to Mu'awiyah in the best interest of the community: "O people, surely it was God who led you by the first of us and Who has spared you bloodshed by the last of us. I have made peace with Mu‘awiyah, and I know not whether haply this be not for your trial, and that ye may enjoy yourselves for a time. [lower-alpha 8]" declared Al-Hasan. In his own speech Mu‘awiyah told them that the reason why he had fought them was not to make them pray, fast, perform the pilgrimage, and give alms, considering that they had been already doing those, but to be their Amir (Commander or Leader), and God had bestowed him that against their will. [lower-alpha 9] According to some sources, he also said "The agreement I made with Hasan is null and void. It lies trampled under my feet. "[lower-alpha 10] Then he shouted: "God's protection is dissolved from anyone who does not come forth and pledge allegiance. Surely, I have sought revenge for the blood of Uthman, may God kill his murderers, and have returned the reign to those to whom it belongs in spite of the rancor of some people. We grant respite of three nights. Whoever has not pledged allegiance by then will have no protection and no pardon." The people rushed from every direction to vow allegiance. While still camping outside Al-Kufah, Mu‘awiyah faced a Kharijite revolt. He sent a cavalry troop against them, but they were beaten back. Mu'awiyah now sent after Al-Hasan, who had already left for Al-Medinah, and commanded him to return and fight against the Kharijites. Hasan, who had reached al-Qadisiyyah, wrote back: "I have abandoned the fight against you, even though it was my legal right, for the sake of peace and reconciliation of the Community. Do you think I shall fight together with you?" In the nine-year period between Hasan's abdication in 41 AH (660 ACE) and his death in 49 AH (669 ACE), Al-Hasan retired in Al-Medinah, trying to keep aloof from political involvement for or against Mu‘awiyah. In spite of that, however, he was considered the chief of Muhammad's household, by Banu Hashim themselves and the partisans of ‘Ali, who pinned their hopes on his final succession to Mu‘awiyah. Occasionally, Shi‘ites, mostly from Al-Kufah, went to Al-Hasan and Al-Husayn in small groups, and asked them to be their leaders, a request to which they declined to respond. Al-Hasan has been quoted as commenting "If Mu‘awiyah was the rightful successor to the Caliphate, he has received it. And if I had that right, I, too, have passed it on to him; so the matter ends there." Madelung has quoted Al-Baladhuri,[lower-alpha 11] as saying that Al-Hasan, on the basis of his peace terms with Mu‘awiyah, sent his tax collectors to Fasa and Darabjird. The caliph had, however, instructed ‘Abdullah ibn ‘Amir, now again governor of Al-Basrah, to incite the Basrans to protest that this money belonged to them by right of their conquest. And that they chased Al-Hasan's tax collectors out of the two provinces. According to Madelung, however, that Al-Hasan would send tax collectors from Al-Medinah to Iran, after just having made plain that he would not join Mu‘awiyah in fighting the Kharijites, is entirely incredible. In any case as Mu‘awiyah came to know that Al-Hasan would not help his government, relations between them became worse. Al-Hasan rarely, if ever, visited Mu‘awiyah in Damascus, Al-Sham, though he is said to have accepted gifts from him. Al-Hasan's closeness to Muhammad was such that, for example, when Muhammad wanted to curse with the Najrani Christians, Al-Hasan was with him. [Quran 3:61] Muhammad also said: "who worries him, has worried me," or "Hasan is from me, and I am from him." It is related that Al-Hasan spent most of his youth in "making and unmaking marriages", so that "these easy morals gained him the title mitlaq, the divorcer, which involved ‘Ali in serious enmities." According to his grandson, ‘Abdullah ibn Ḥasan, he usually had four free wives, the limit allowed by the law. [lower-alpha 12] Stories spread out on this subject and have led to the suggestions that he had 70 or 90 wives in his lifetime,[lower-alpha 13] along with a harem of 300 concubines. According to Madelung, however, These reports and descriptions are "for the most part vague, lacking in names, concrete specifics and verifiable detail; they appear to be spun out of the reputation of al-Hasan as a mitlaq, now interpreted as a habitual and prodigious divorcer, some clearly with a defamatory intent." Living in his father's household, "Ḥasan was in no position to enter into any marriages not arranged or approved by him." Says Madelung. According to Ebn Saa'd (pp. 27–28), whose information seems to be more reliable, however, Hasan had 15 sons and 9 daughters from six wives and three named concubines. Many of these children died in their early years. It is said that most of these marriages had a political intent in his father's interest, for he gave a part of his Kunya (Arabic: كُـنـيـة‎‎, Nickname), "Abu Muḥammad" (Arabic: أبـو مـحـمّـد‎‎, "Father or Muhammad"), to the first son from his first freely chosen wife after ‘Ali's death, Ḵawla bint Manẓur, daughter of a Fazāra chief and former wife of Muhammad ibn Talhah. He evidently wanted to make this son his primary heir. However, after Muhammad died, Al-Ḥasan chose his second son from Ḵawla, called 'Ḥasan', as his heir. It is implied that frequently divorcing women was contrary to Al-Hasan's wisdom, therefore, that the accusation that he did so was false. "Al-Nijah al-Taii" in "Al-Sirat an-Nabawiyyah" says that one of politics of Mu‘awiyah was to destroy the image of ‘Ali and his family, in the eyes of Muslims. The first marriage of Al-Hasan was probably with Salma, or Zaynab, daughter of the renowned Kalbite chief Imru' ul-Qays who was appointed by Umar as commander over a region who would accept Islam. ‘Ali, together with his sons Al-Hasan and Al-Husayn, came forth to meet him and proposed establishing marriage ties. Born in the years 3/624—5 and 4/626, Hasan and Husayn, were too young for the wedding to have taken place immediately. In the later years of Ali's reign, Hasan may never actually have married Salma, or may have divorced her before this time. Probably soon after ‘Ali's arrival in Kufa, Hasan married Ja'da, daughter of the Kinda chief al-Ash'at (‘Ali evidently was eager at this time to establish an alliance with the powerful Yemenite tribal coalition in Kufa.) Madelung relates two different accounts concerning how Ja'da's father or Hasan's father made them marry together. Although childless, she evidently was not divorced by him. She is commonly accused of having poisoned Hasan at the instigation of Muawiyah. Probably also soon after his arrival in Kufa, before the battle of Siffin, Al-Hasan married Umm Bashir (in some sources Umm Bishr), daughter of Abu Mas'ud who had settled in Kufa at an early stage and was among those opposed to the Kufan rebellion against Uthman. Ali evidently hoped to draw him to his side and presumably arranged the marriage of his daughter to Hasan. Then he appointed him governor of Kufa during his absence for the campaign to Siffin. After his abdication and return to Al-Medinah, Al-Hasan married Khawla, daughter of the Fazara chief Manzur ibn Zabban (Fazara belonged to the large Northern Arab tribal association claiming descent from Qays). Previously she had been married to Talha's pious son Muhammad, who was killed in the Battle of the Camel, and had two sons and a daughter by him. She is said either to have been given in marriage to Hasan by Abd Allah ibn al-Zubayr, who was married to her sister Tumadir or to have herself given the choice to Hasan, who then married her. Upon hearing this, her father declared that he was not someone to be ignored with respect to his daughter. He came to Medina and planted a black flag in Al-Masjid al-Nabawi. All Qaysites (descent from Qays) present in Medina assembled under it in solidarity with him. Hasan now surrendered her to him, and he took her away to Quba'. She reproached him, quoting the hadith: "Al-Hasan ibn Ali will be the lord of the youth among the inmates of paradise." He told her: "Wait here, if the man is in need of you, he will join us here." Hasan came to them accompanied by his brother Husayn, his cousins Abdullah ibn Ja'far and Abd Allah ibn Abbas and took her back, marrying her this time with the approval of her father. Khawla bore Hasan his son al-Hasan, from whom the Najafi dynasty of Bengal claim direct descent. In Al-Medinah, Al-Hasan married Hafsah the daughter of Abdul-Rahman ibn Abi Bakr. Al-Mundhir ibn al-Zubayr was in love with her, and spread a false rumor about her. As a result, Al-Hasan divorced her. The report characterizes him in this context as Mitlaq, evidently meaning here: ready to divorce on insubstantial grounds. Next Asim, the son of Umar, married her. Al-Mundhir falsely accused her before him, and he also divorced her. Then al-Mundhir proposed marriage to her, but she refused, saying: "He has tried to destroy my reputation." He pursued her with further proposals, and she was advised to marry him so that it would become patent to everybody that he had falsely accused her. She did so, and the people realized that he had lied about her and what his motive had been. Al-Hasan also married Talhah's daughter Umm Ishaq in Al-Medinah. Muawiyah had asked her brother Ishaq ibn Talha in Damascus to give her in marriage to his son Yazid. Ishaq told him that he was going to Medina; if Muawiyah sent a messenger to him there, he would conclude the marriage contract. After Ishaq had left, his brother Isa ibn Talha visited Muawiyah. When the caliph told him about Ishaq's promise, Isa offered to give Umm Ishaq immediately in marriage. He concluded the marriage contract with Yazid without consulting her. In the meantime, Ishaq had arrived in Medina and contracted her marriage to Hasan. It was not exactly known which of the two contracts was earlier, and Muawiyah advised his son to leave the matter. Her marriage with Hasan was now consummated, and she bore him his son Talha, who later died childless. Before his death, Hasan recommended to his brother Husayn that he marry her. She bore Husayn's daughter Fatima. Presumably still later she was married to Abu Bakr's great-grandson Ibn Abi Atiq Abd Allah, to whom she also bore a daughter, Amina. Al-Hasan further married Hind the daughter of Suhayl ibn Amr, in Al-Medinah. She had been married first to the Umayyad Abd al-Rahman ibn Attab, who was killed in the Battle of the Camel, and then to Abd Allah ibn Amir ibn Kurayz. When the latter divorced her, Muawiyah wrote to Abu Hurairah in Medina to contract her marriage with his son Yazid I. On his way to meet her, Abu Hurayra met Hasan who inquired where he was going. When Abu Hurayra explained his mission, Hasan suggested that he mention him, Hasan, to her. Abu Hurayra did so, and Hind asked him to make the choice for her; Abu Hurayra chose Hasan. Some time later Abd Allah ibn Amir came to Medina and complained to Hasan that his former wife had a deposit belonging to him in her possession. Hasan allowed him to see her in his presence. As Ibn Amir looked at her sitting in front of him, he softened up towards her, and Hasan suggested: "Shall I relinquish her to you? I think you could not find a better husband to make remarriage licit (muhallil) for you than myself." Ibn Amir insisted: "My deposit." She produced two boxes filled with jewels. Ibn Amir took a handful out of each one and left the rest to her. Later she would comment about her three husbands: "The lord (Sayyid) of all of them was al-Hasan; the most generous of them was Ibn 'Amir; and the one dearest to me was 'Abd al-Rahman b. 'Attab." 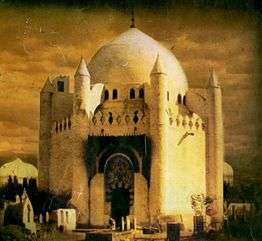 The historical tomb of Al-Baqi', which stood over the qabr (Arabic: قَـبـر‎‎, grave) of Al-Hasan, and was destroyed in 1925. The qubur (Arabic: قُـبـور‎‎, graves) of Al-Hasan (background, left), his nephew and son-in-law ‘Ali Zaynal-‘Abidin, grandson Muhammad al-Baqir, and great-grandson Ja'far al-Sadiq, at Al-Baqi‘ in Al-Medinah, besides others. The early sources are nearly in agreement that Al-Hasan was poisoned by his wife, Ja'da bint al-Ash'at, at the instigation of Mu‘awiyah and died in the year 670 ACE. [lower-alpha 14][lower-alpha 15] Madelung and Donaldson further relate other versions of this story, suggesting that Al-Hasan may have been poisoned by another wife, the daughter of Suhayl ibn ‘Amr, or perhaps by one of his servants, citing early historians such as Al-Waqidi and Al-Mada'ini. Madelung believes that the famous early Islamic historian al-Tabari suppressed this tale out of concern for the faith of the common people. Al-Hasan is said to have refused to name his suspect to Al-Husayn, for fear that the wrong person would be killed in revenge. He was 38 years old when he abdicated the reign to Mu‘awiyah, who was 58 years old at the time. This difference in age indicates a serious obstacle for Mu‘awiyah, who wanted to nominate his son Yazid as his heir-apparent. This was unlikely due to the terms on which Al-Hasan had abdicated to Mu‘awiyah; and considering the big difference in age, Mu‘awiyah would had have not hoped that Al-Hasan would naturally die before him. Hence, Mu‘awiyah would naturally be suspected of having a hand in a killing that removed an obstacle to the succession of his son Yazid. The burial of Al-Hasan's body near that of his grandfather, Muhammad, was another problem which could have led to bloodshed. Al-Hasan had instructed his brothers to bury him near his grandfather, but that if they feared evil, then they were to bury him in the Cemetery of Al-Baqi‘. The Umayyad governor, Saʿid ibn al-ʿĀṣ, did not interfere, but Marwan swore that he would not permit Al-Hasan to be buried near Muhammad with Abu Bakr and ‘Umar, while ‘Uthman was buried in the Cemetery of Al-Baqi‘. Banu Hashim and Banu Umayyah were on the verge of a fight, with their supporters brandishing their weapons. At this point, Abu Hurairah, who was on the side of Banu Hashim, despite having previously served Mu‘awiyah on a mission to ask for the surrender of the killers of ‘Uthman, tried to reason with Marwan, telling him how Muhammad had highly regarded Al-Hasan and Al-Husayn. Nevertheless, Marwan, who was a cousin of ‘Uthman, was unconvinced, and ‘A'ishah, while sitting on a mule surrounded by her supporters, seeing the parties and their weapons, decided not to permit Al-Hasan to be buried near his grandfather, fearing evil would occur. She said: "The apartment is mine; I shall not permit anyone to be buried in it." Ibn ‘Abbas, who was also present at the burial, condemned ‘A'ishah by comparing her sitting on the mule at the funeral to her sitting on a camel in a war against Al-Hasan's father at the Battle of Jamal. Her refusal to allow Al-Hasan to be buried next to his grandfather, despite allowing her father, Abu Bakr, and ‘Umar to be buried there, offended the supporters of ‘Ali. Then Muhammad ibn al-Hanafiyyah reminded Al-Husayn that Al-Hasan made the matter conditional by saying "unless you fear evil." Ibn al-Hanafiyyah further asked "What evil could be greater than what you see?" And so the body was carried to the Cemetery of Al-Baqi‘. Marwan joined the carriers, and, when questioned about it, said that he gave his respect to a man "whose hilm (Arabic: حِـلـم‎‎, forbearance) weighed mountains." Governor Sa‘id ibn al-‘As led the funeral prayer. The shrine containing Hasan's tomb was destroyed once in 1925 during the conquest of Medina as part of a general destruction of memorials in cemeteries for religious reasons. "In the eyes of Wahabis, historical sites and shrines encourage "shirq" – the sin of idolatry or polytheism – and should be destroyed." Wikisource has the text of the 1905 New International Encyclopedia article Hasan and Hosein. ↑ See Goldziher, Muhammedanische Studien, II, 105-6; Y. Friedmann, 'Finality of Prophethood in Sunni Islam', JSAI, 7 (1986), 177-215, at 187-9. ↑ See also Ibn Abi l-Hadld, Shark, XVI, 15; Abu al-Faraj, Maqdtil, 70. ↑ See Ya'qubi; vol.ll, p.192; Abu'l-Fida, vol.l, p.183. ↑ Al-Baladhuri, Ansab, III, 47. ↑ See also Ebn Saa'd, p. 68. ↑ These reports are also accepted by the major Sunnite historians Al-Waqidi, Al-Mada'ini, ‘Umar ibn Shabba, Al-Baladhuri and al-Haytham ibn ‘Adi. 1 2 3 Suyuti, Jalaluddin. تاریخ الخلفاء. 1 2 3 4 5 6 7 8 9 10 11 12 13 14 15 16 17 18 19 Donaldson, Dwight M. (1933). The Shi'ite Religion: A History of Islam in Persia and Irak. BURLEIGH PRESS. pp. 66–78. 1 2 3 4 5 6 7 8 9 10 11 12 13 14 15 16 17 18 19 20 21 22 23 24 Jafri, Syed Husain Mohammad (2002). The Origins and Early Development of Shi’a Islam; Chapter 6. Oxford University Press. ISBN 978-0195793871. ↑ Tabåatabåa'åi, Muhammad Husayn (1981). A Shi'ite Anthology. Selected and with a Foreword by Muhammad Husayn Tabataba'i; Translated with Explanatory Notes by William Chittick; Under the Direction of and with an Introduction by Hossein Nasr. State University of New York Press. p. 137. ISBN 9780585078182. 1 2 Lalani, Arzina R. (March 9, 2001). Early Shi'i Thought: The Teachings of Imam Muhammad Al-Baqir. I. B. Tauris. p. 4. ISBN 978-1860644344. 1 2 3 4 5 6 7 8 9 10 11 12 13 14 15 Momen, Moojan (1985). An Introduction to Shi'i Islam. Yale University Press. p. 14,26,27. ISBN 978-0-300-03531-5. 1 2 3 4 5 6 Madelung 2003. 1 2 3 4 5 6 Tabatabai, Sayyid Muhammad Husayn (1997). Shi'ite Islam. Translated by Seyyed Hossein Nasr. SUNY press. pp. 65,172–173. ISBN 0-87395-272-3. 1 2 3 Sharif al-Qarashi2, Baqir (2000). The Life Of Imam Musa Bin Ja'far aL-Kazim (PDF). Translated by Jasim al-Rasheed. Iraq: Ansarian. pp. 200–202. ↑ Madelung 1997, pp. 166–167. ↑ Article "AL-SHĀM" by C.E. Bosworth, Encyclopaedia of Islam, Volume 9 (1997), page 261. ↑ Kamal S. Salibi (2003). A House of Many Mansions: The History of Lebanon Reconsidered. I.B.Tauris. pp. 61–62. ISBN 978-1-86064-912-7. To the Arabs, this same territory, which the Romans considered Arabian, formed part of what they called Bilad al-Sham, which was their own name for Syria. From the classical perspective however Syria, including Palestine, formed no more than the western fringes of what was reckoned to be Arabia between the first line of cities and the coast. Since there is no clear dividing line between what are called today the Syrian and Arabian deserts, which actually form one stretch of arid tableland, the classical concept of what actually constituted Syria had more to its credit geographically than the vaguer Arab concept of Syria as Bilad al-Sham. Under the Romans, there was actually a province of Syria. with its capital at Antioch, which carried the name of the territory. Otherwise. down the centuries, Syria like Arabia and Mesopotamia was no more than a geographic expression. In Islamic times, the Arab geographers used the name arabicized as Suriyah, to denote one special region of Bilad al-Sham, which was the middle section of the valley of the Orontes river, in the vicinity of the towns of Homs and Hama. They also noted that it was an old name for the whole of Bilad al-Sham which had gone out of use. As a geographic expression, however, the name Syria survived in its original classical sense in Byzantine and Western European usage, and also in the Syriac literature of some of the Eastern Christian churches, from which it occasionally found its way into Christian Arabic usage. It was only in the nineteenth century that the use of the name was revived in its modern Arabic form, frequently as Suriyya rather than the older Suriyah, to denote the whole of Bilad al-Sham: first of all in the Christian Arabic literature of the period, and under the influence of Western Europe. By the end of that century it had already replaced the name of Bilad al-Sham even in Muslim Arabic usage. ↑ Madelung, Wilfred (1998). The Succession to Muhammad. Cambridge University Press. p. 287. ISBN 9780521646963. 1 2 Madelung, Wilferd (1997). The Succession to Muhammad: A Study of the Early Caliphate. Cambridge University Press. ISBN 0-521-64696-0. ↑ Madelung, Wilfred (1998). The Succession to Muhammad. Cambridge University Press. p. 332. ISBN 9780521646963. ↑ Tomass, Mark (2016). The Religious Roots of the Syrian Conflict. Springer. p. 68. ISBN 9781137525710. ↑ Tomass, Mark (2016). The Religious Roots of the Syrian Conflict. Springer. p. 67. ISBN 9781137525710. ↑ Ibn Abd al-Barr. بهجة المجالس وأنس المجالس. p. 100. ↑ Taylor, Jerome. "Mecca for the rich: Islam's holiest site 'turning into Vegas' , by , 24 September 2011.". The Independent.